It's that time of the year again as the summer holidays are here and you're looking for fun and inexpensive ideas to entertain your child. The most important thing to keep in mind is that children, even the youngest toddlers, are perfectly capable of entertaining themselves with a little encouragement. We all frequently hear the mantra "I'm bored", but when a child's interest is not engaged, the best thing for parents to do is to guide them to find ways they can entertain themselves so that the parent does not become the focus of their activity. Aim for activities that engage the senses and are at the right level of difficulty and are not too challenging or too easy for your child. There are so many inexpensive ways for children to amuse themselves rather than while away the hours in front of a television, DVDs or video games. Get outdoors and explore nature as your child is never too young for a walk. 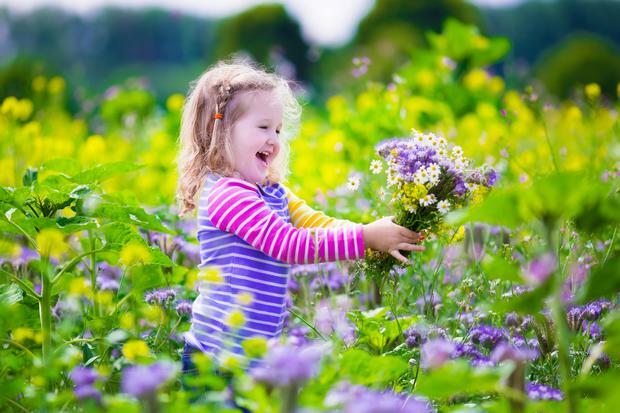 Taking your child outside to see trees, birds, leaves and flowers is stimulating and important for their brain development. Depending on the age of your child/children, try to be realistic about how much walking they will be happy to do. The point of a nature walk is to get up close to nature, not to do a forced march with unhappy children. Education is important, but memory-making and having fun are too. If your children aren't enjoying themselves, they're not likely to want to do it again. Nature walks should be pleasant, peaceful and enjoyable. Once you're on your walk, you can collect flowers, cones, stones or shells, look at the birds flying in the sky or play hide and seek in the park. Every walk is an opportunity for children to learn about the natural world. Leave electronic toys at home so that your child can focus on the world around them and bring paper and crayons so they can draw what they see. Take an inexpensive magnifying glass so your child can get up close and personal with nature and look for ants, spiders or woodlice on the ground. Check your local library for books that will help children learn more about animals, plants, and whatever else they observe. Children love to see the variety of caterpillars, birds and flowers in these identification books. To extend the day, include a picnic, as a meal is definitely more fun on a blanket in the park or woods, or even in the garden. Older children could also take photographs with a disposable camera which could then form part of their summer scrap book. Ideas for activities for toddlers require a little more thought and creativity as they mostly want to explore everything with their mouths, as well as not always understanding direction or having a long attention span for most activities. Back to basics and simple is often best for the toddler age range as they love sensorial activities. Quite often, the best of all the activities for toddlers is a material by itself. Consider using natural materials - let your toddler explore a natural material with their fingers, nose, mouth. How does it feel? What does it taste like? These are wonderful ways to learn and very hands-on. Be brave and encourage your child to explore flour freely, or mix it with water or add food colouring to cooked spaghetti. Be prepared for a mess but it is worth it as your child will have great fun exploring texture. Water is another great resource as playing with water never gets old for children. Be creative and add food colouring to it for added fun. Let them play with cups, spoons and funnels for hours. A cardboard box also works wonders. Let them play with the box, the larger the better. The cardboard box works for older children as well as it inspires creativity and imagination as children transform and reinvent them into something else. Allow your child absolute freedom to use the boxes how they see fit. A child might sit quietly in a box, but it doesn't mean they aren't exploring or creating. Let them use their imagination and materials in a way that is enjoyable and entertaining to them, and you never know what they'll come up with. Remember, don't be a backseat driver, step back and let your child decide how to play with their box. Active and self-directed exploration is not only engaging, but educational. Children begin to understand the world by manipulating it - they can act out things they have seen or experienced. By letting them be in control, you are helping them understand the world and express themselves. Summer brings many free and wonderful activities for older children and there is often a range of relatively affordable dance, football or art camps running in your local community, so you may want your child may want to attend one of these with their friends to break up the summer holidays. There are also lots of fun and entertaining things to do at home and in your local area to encourage your child's imagination and creativity. Visit the library: Public libraries often offer free summer reading programmes that include workshops, movies, children's theatre, puppet shows and more. Or just check out how-to books so you and your child can learn something new together like making your own puppets or learning a new craft. Create comic books together and then swap and share them with their siblings and friends. Drama and art: Many children love to dance and sing, so get their artistic juices flowing and make a film with your video recorder, smart phone or iPad. If you have access to a computer with free film-editing software, upload the video and add special effects to it. If your child is old enough, they may wish to explore this technology and do it themselves. If you're not technically inclined or don't have film-making equipment, invite your child's friends around and encourage them to create a play instead or have a dance party. Play your child's favourite tunes and let them boogie and find their groove. Art is always a favourite for all ages but painting can be messy, so why not take it outside on a nice day. You may need to be more imaginative with older children and release your inner Jackson Pollock (the artist known for drip spraying and splattering large canvases). Use a large piece of material, sheet or canvas, lay it on the ground and join your child in splattering it with paint using a toothbrush or small paintbrushes and enjoy getting creative together. Water: Water is a favourite for all ages; just make sure that you have lots of towels and spare clothes for everyone at the end of the day. For younger children, set up your very own water table, using a big plastic basin where they can clean their toy cars and animals or they can simply enjoy splashing and pouring. For older children, create a water park in the back garden, turn on the sprinkler, fill the baby pool, and let the children have fun cooling off on a hot day - this activity will require supervision so maybe move outdoors and spend the day in the garden with your children. If they begin to tire of the inflatable pool, make it fun again by filling it with bubbles - and tossing small toys in for them to find under all the foam. And if you are feeling brave and adventurous, join your children in a balloon water fight. Take the stress out the summer and don't over plan your days, as often the most simplest of activities are the most enjoyable. The best part is spending time together with your child and making happy childhood memories together.